POTENSIA: Jurnal Kependidikan Islam has been indexed in DOAJ since Sept 29, 2017. POTENSIA: Jurnal Kependidikan Islam has become a Crossref Member since year 2018. Therefore, all articles published by POTENSIA: Jurnal Kependidikan Islam will have unique DOI (Digital Object Identifier) number. In 2018, POTENSIA: Jurnal Kependidikan Islam has been accredited by Decree of the General Director of Strengthening Research and Development, Ministry of Research, Technology and Higher Education of the Republic of Indonesia Number 21/E/KPT/2018. The Editorial Team of the journal welcomes contributions of papers on any topics related to Islamic Education whether in Indonesia, English or Arabic throughout the year. 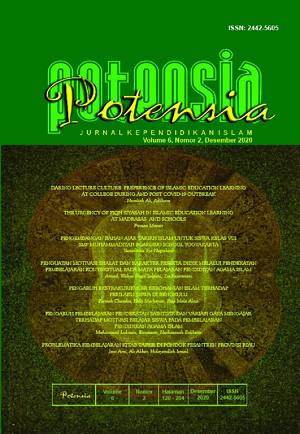 POTENSIA: Jurnal Kependidikan Islam is published by Fakultas Tarbiyah dan Keguruan Universitas Islam Negeri Sultan Syarif Kasim Riau. POTENSIA: Jurnal Kependidikan Islam is licensed under a Creative Commons Attribution 4.0 International License.